Another St. Patrick’s Day, that celebration of all things Irish– parades, pints and more Kelly green than the mind can fully process. They say that well over 30 million Americans claim to have Irish roots. Growing up, I always believed we did as well because my grandmother was an O’dell, which certainly seems Irish. But doing genealogy over the last decade I have discovered that the O’dell was changed through the years from Odell and before that from Odle and, most likely, before that from Woddell, It turns out that it was not Irish at all. No, it was British. And for the Irish that is a big distinction. But I also discovered that my father’s great-grandparents were Irish immigrants during the Great Migration of the middle of the 19th century. It was something I wasn’t sure of before I started my genealogy work. I still haven’t found where they originally came from in Ireland. Their’s was a pretty stock story. The father, Michael Patrick Tobin, worked on building the railroads in central New York, ultimately settling in the Binghamton area, where most of his family worked for the next several decades in the tobacco industry there. Most were tobacco strippers or cigar makers. I am not positive that his wife was actually born in Ireland. There are conflicting accounts but her parents definitely were. She was the subject of one of my Icon paintings from a couple of year’s back shown here on the right. Her story is an interesting one, one that I wrote about on this blog. You can read it by clicking here. So, it turns out I am one of those 30-some million with a bit of Irish blood, about 16% according to the DNA tests. I don’t give it much thought except on this particular day and even then I realize that these folks were little different than most of my other ancestors from other countries who left the hardships of their homelands for what they hoped would be a better life in America. I can’t say they all found wonderful lives but perhaps they were a bit better off than they might have been had they stayed put. Okay, here a bit of Irish music for the day, a nice reel, The Glen Road to Carrick, from a contemporary Irish group, FullSet. I like the feel of this- it has a fresh edge that makes me want to drive too fast. 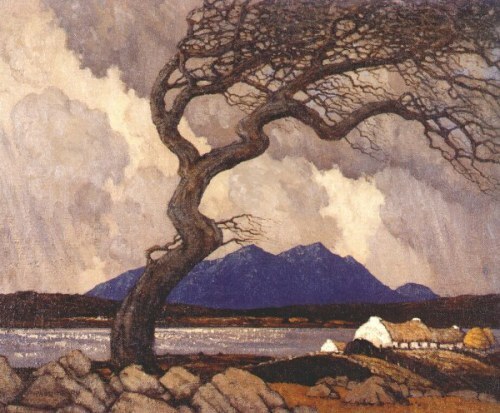 By the way, the painting at the top is from a late Irish painter, Paul Henry, who painted primarily in the first half of the 20th century. I am a fan of his work and featured it here a couple of years back.